If Google were to pinpoint their ideal consumer to target their Chromebook ethos of cloud computing to, then I’d probably be it. With the arrival of Google’s new Chromebook, a significantly slim, remarkably light, ARM-powered laptop designed by Samsung and available for just £229, Google’s vision of cloud computing is suddenly a compelling proposition. Let me explain why. My MacBook has been a loyal, excellent servant over the years but it’s gradually slowing down. The fans whirl after watching a 30-second video; the computer takes an age to start and connect to the Internet after being shut down. The massive hard drive is only occupied by songs I downloaded years ago and programs I no longer need. It’s heavy, cumbersome and the battery has lost some of its charging capacity. And last but not least, if you place it on your lap, you’re going to experience some severe global warming. But, even in its twilight years, my MacBook is still a perfectly capable machine; however, it just feels like overkill these days. I no longer use iTunes, Pages, iCal or Mail anymore; I use Deezer, Google Docs, Google Calendar and Google Mail. I can’t remember the last time I used the optical drive and my line of work doesn’t require processor heavy programs such as Photoshop. So why would I spend around £900 or more on a new MacBook when I use only 5% of its capabilities: the screen, keyboard, wifi connection and trackpad? It just didn’t make any logical sense. But what about Windows? Yes, I could get a cheaper desktop machine, with arguably better specs. But again, with it comes numerous complications and unwanted hassles: the need for anti-virus software, long boot times, pointless programs and unnecessary bloatware. The same goes for Notebooks. They’re still Windows machines at the end of the day, just smaller and less powerful. How about a tablet then? If all I need is the Internet and a couple of online programs, why not buy a Bluetooth keyboard and work on a tablet? Well, first of all, once you’ve bought a decent tablet and a keyboard the price works out higher than you’d think, not to mention it’s hardly the most comfortable of configurations. Balancing a tablet and resting a keyboard on your lap whilst you tap at the touch screen is an awkward, disjointed experience (believe me, I’ve tried). Second, I’d ultimately have to sacrifice the best parts of a laptop: a fully functioning keyboard, a trackpad and a large display. Again, this solution wasn’t right for me. Cue my intrigue in Google’s much-maligned Chromebooks. If you thought Macs were the very definition of computing simplicity then you were wrong. That prestigious award goes to the Chromebook. They boot-up in seconds. They’re immune to viruses, annoying updates and heavy bloatware, all of which slows your laptop’s speed over time. If you’re familiar with using an internet browser, specifically Chrome, then you’re already familiar with using a Chromebook. Just open the lid, type in your password and voila, you’re ready to go. In the past, this attractive simplicity was hindered by sub-par hardware and off-putting prices. But not anymore. Google’s new Samsung Series 3 Chromebook does away with the bulk, bloat and beastly price tag of the series’ past products. But is a web-reliant laptop even worth that price? In a nutshell, yes; just as long as you can accept the concessions outlined above. When I removed the new Chromebook from the box, which was embarrassingly big for the diminutive product inside, my initial impressions were generally positive. The satisfying silver sheen that crudely attempts to mimic another certain slim and light laptop on the market is aesthetically pleasing enough. And, even though the device is crafted entirely out of good old-fashioned plastic, the build quality has been surprisingly solid thus far. However, it isn’t the most robust of laptops, so bear that in mind if you’re a bit of a klutz with a tendency to break things. 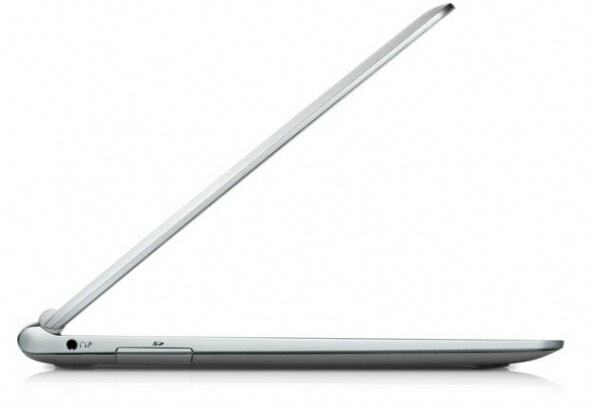 The laptop itself weighs in at just 1.1kg and is 17.5mm thin. It’s relatively impressive at a glance and effortless to carry. Better still, you can comfortably place it on your lap, or chuck it in your bag and you’ll barely know it’s there, which leads to the inevitable consequence of having to periodically check to make sure you haven’t been robbed. Once you’ve plugged in the charger – which is almost as heavy as the device itself – the Chromebook’s first unique selling point immediately announces itself, in conjunction with arguably its most disappointing feature: dramatically fast boot-up times but a disappointingly lacklustre screen. The 11.5-inch screen has a resolution of 1366×768 and a matte finish as opposed to glossy. Though it’s pleasingly sharp and effective at minimising glare, the matte finish comes at a cost of screen clarity, with a slightly grainy appearance as a result. On top of that, viewing angles are noticeably poor with an overly cool (blue) calibration and washed out colours. However, once you’ve got the brightness at a comfortable level it’s more than adequate for a browsing and writing documents in Google Drive. 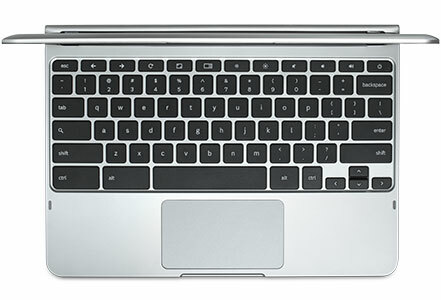 The trackpad is a pleasure to use on the Samsung Series 3 Chromebook. It’s responsive to key gestures such as two-finger scrolling and moving the cursor around; it feels silky smooth and physical clicks are met with a satisfying…click. Naturally, the trackpad isn’t completely immune to failing to register the odd finger tap here and there, but during my time of use, it’s been a cut above what I expected and definitely one of the better trackpads on the market. The keyboard, on the other hand, is excellent. The chiclet-style keys are perfect for fast touch typing and a writer’s dream to work on every day. At this price, you won’t find any backlit keys, but you’d be seriously hard pressed to find anything to complain about when it comes to typing on the new Chromebook. You’ve got access to brightness, volume, refresh, forward and back, and a full-screen mode, too, but users should note that there is no Caps Lock key or dedicated Delete key. Instead, the Caps Lock key acts as the Chromebook’s search function and quick access to apps. But fret not, as these can be mapped in if you end up missing them. I for one did not. In regards to the operating system, Chrome OS is the most simplistic and accessible operating system out there, closely followed by Linux. You can tinker with a few settings in the backend such as changing wallpapers, touchpad speeds and various web accessibility settings but that’s about it. There are no programs to install on the Chromebook, at least not in the traditional sense, just apps and extensions. Access the Chrome Store and you’ll find a plethora of apps to help you get things done, with plenty of viable alternatives to replace your favourite programs of old. The most important piece of tech for the new Chromebook actually lies inside: The Exynos 5 dual processor. Samsung’s darling of the industry (unless you’re Intel, of course) is what separates this particular Chromebook from the pack and is also the reason the device is so slim, cool, cheap, fast and light. The Series 3 is also the first consumer product to feature the next-generation of ARM processor architecture, Cortex-A15. The end result is a laptop which has excellent performance under reasonable use. If you’re a power user who consistently has over 12 tabs or more open at a time then move swiftly along as the performance will begin to stutter under heavy load and pages will automatically refresh if you’re not using them. However, if you’d like an example of what constitutes ‘reasonable use’ I frequently have around 6 to 7 tabs open at once: Google Drive, a Google doc, Google Mail, Deezer streaming music, Tweetdeck, a Google search, a website and Google chat running in the background. As of yet, I haven’t encountered any noticeable slowdown. The ARM processor also brings with it the marvellous prospect of a fanless, truly silent laptop. After listening to my MacBook’s fans whir up at the sight of merely an image recently, it’s strangely relaxing to sit with the Chromebook and hear absolutely nothing but the tapping of your fingers on the keyboard. It should also be noted that the Chromebook can be used safely on your lap without the fear of sterilisation as it emits minimal heat. There are 6.5 hours of battery life from a full charge – a claim which is about right depending on your usage and factoring brightness settings – and located on the back of the device is a USB 2.0 port, a USB 3.0 port, the power socket and a HDMI out. The HDMI out is a great addition but ultimately feels like a huge missed opportunity as it’s disappointingly finicky to use. You have to press CTRL + fullscreen to enable it which isn’t obvious to everyone. In fact, I had to Google how to get Google’s Chromebook to work through HDMI. Also, due to the need to output a 1080p image, the Chromebook’s performance does deteriorate when using a monitor. There’s a headphone jack and SD card slot located to the left-hand side if you want to expand the laptop’s 16GB of internal flash storage and 2GB of ram onboard. Google also throws in 100GB of Google Drive storage for two years. Not bad for £229, then, I’m sure you’ll agree. There’s also built-in dual-band wi-fi, a VGA camera and an ambient light sensor above the screen, plus Bluetooth built-in. The speakers are located at the bottom and are decent enough. 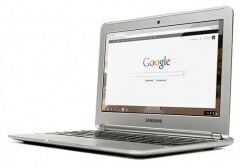 So should you buy a Chromebook? Well, that depends. If the question is whether you should buy the new Samsung Series 3 Chromebook over the other Chromebooks on the market, then I’d wholeheartedly say yes. It’s portable, silent and definitely value for money. If you’re still scratching your head over the need for an internet connection at this point in the review (though a lot of key apps do work offline), then you definitely won’t be interested in buying a Chromebook. And that’s a shame because if you embrace what’s on offer, the new Chromebook could be the ideal laptop you’ve been looking for. But, and it’s a big but, it entirely depends on whether you can accept the obvious flaws of the Chromebook ethos and if the positives outweigh the negatives. It certainly isn’t for ‘everyone’ as Google boldly claims. Nevertheless, for just £229, it’ll definitely be right for some. Adam Vjestica is a freelance writer and the Editor-in-Chief of Sumonix, a big-bellied video games website full of features, reviews and full-fat gaming. You can follow Adam on Twitter at @ItsMrProducts.